Hamish Hamilton, 1949, Hardback in Dust Wrapper. Condition: Good+ — in Good Dust Wrapper. Unlaminated dust wrapper a little edgeworn and faded with heavy tanning to the spine and several nicks and chips. Previous owners' inscription to the first blank. Pages very gently age-tanned. 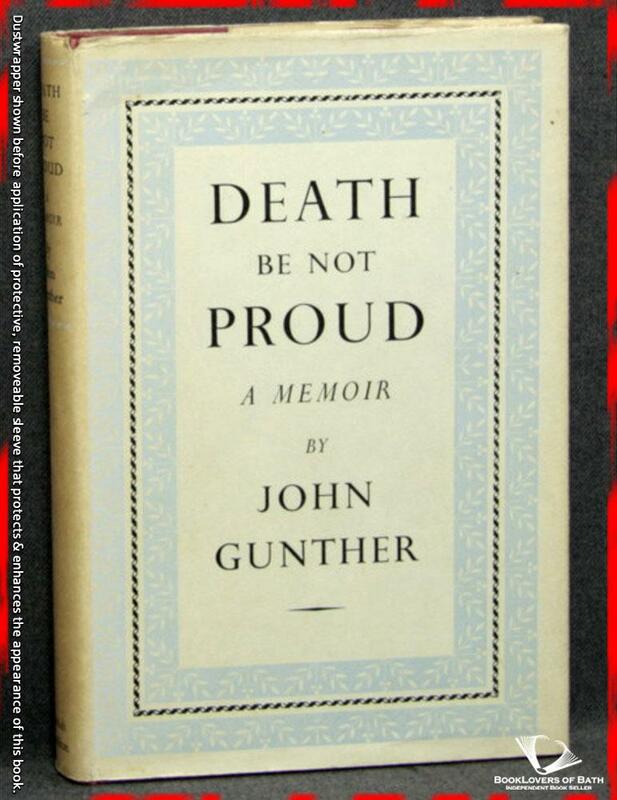 From the cover: “In the summer of 1947, John Gunther’s only son, Johnny, died, following a series of operations for tumour of the brain. This book is at once a memorial to a boy whose level-headed courage and patience during his last illness made an unforgettable impression on all who knew him, as well as one of the most dramatic stories ever told about doctors and medicine and superb human determination joined in a desperate fight against a fatal disease. For fourteen months there were operations and X-rays, specialists, successive treatments, periods of alternating hope and despair and a few heartbreaking days when it seemed that all would be well. Size: 7½" x 5". Red boards with Gilt titling to the Spine. 212 pages.